Describe your first encounter with Crapsey’s cinquain “Amaze.” You said in your introduction that it was the first of her poems that you had ever come across, and that you had thought about it for days afterward. What was it that stuck with you for so long? I wrote about this in the introduction, but reading “Amaze” for the first time struck me as a particularly female embodiment of Eliot’s notion that as writers, we are always in conversation with the dead, and that this is not a linear conversation but one that can happen at any moment in time. In other words, I had this keen sense that Adelaide Crapsey was talking to me and about my relationship to her. I don’t mean this as a deluded / egocentric comment; rather, I feel that she is talking to me and women like me, and I think that women poets across time share a sort of transcendent bond, which has to do with the act of bravery we commit by writing poems. The form of the poem–the way it elongates and then suddenly shortens, too, is what makes the poem memorable (and memorizable). This is true of many of her other cinquains, which embody a beautiful marriage of content and form. You have a lot of biography and research about Crapsey. How did you go about finding this information and what were your first steps? 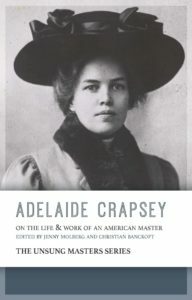 I started by reading all the biographies of Crapsey I could find, as well as scholarly work on her writing and introductions to collections of her work. Then, my co-editor, Christian Bancroft, travelled to Rochester, NY, and was able to spend several days going through the Adelaide Crapsey Papers, and archiving such miscellany as poems, notes, letters, photographs, and drafts. It was through her letters, though, that I think we learned the most about her character and her tenacious spirit. Did you ever experience dead ends when trying to find Crapsey’s letters, poems, and previous library archives? If so, how did you find a way around it? The Crapsey Papers are well-kept and organized, but it was my co-editor who did the archival research, so I can’t fully speak to this question. How did you decide what material to include in the book and in what order? I’m interested in how you made these decisions for the poems, letter, and critical essays in the volume. We included what we considered to be the best and most significant of her poems. We also wanted to highlight work other than her cinquains, which have really been the only poems of Crapsey’s that have been anthologized and received critical attention. Christian made a lot of the decisions about which letters to include, but we made sure to choose the ones that were most characteristic of her voice, and that serve as signposts for different periods of her life. In terms of the critical essays, I reached out to people who had expressed interest in her work, and who I thought would discuss issues that have been missing in the critical work about Crapsey. It was especially important to have Rose Gubele, a Cherokee scholar, address potential issues with appropriation in Crapsey’s translations of Cherokee incantations, as well as to include essays that address her contributions to American poetry by women. I felt it important to stress that Crapsey transcends any generalizations or stereotypes about her gender, her illness, and her use of form. How has learning about Crapsey’s writings influenced your own work as a poet? Enormously! I have conversations with Adelaide Crapsey, and I’ve tried my hand at the cinquain. I think it is very important for us to be in conversation with our poetry ancestors–not to fall into the trap of only reading contemporary poetry. As Eliot said, the dead poets “are that which we know.” It is inspiring to me, also, to be able to have a hand in foregrounding the work of a poet who had been under-recognized in the American literary canon.